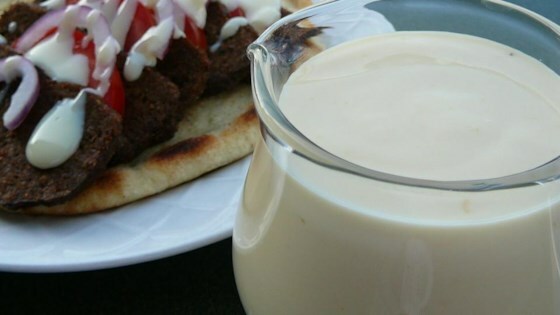 "Donair sauce done just like in Atlantic Canada. Long live Greco!" Whisk together milk, vinegar, and garlic powder in a bowl. Refrigerate for at least 1 hour before using. Bang on, true East Coast perfection! If you chill it for 30min prior to eating it gets even thicker! This is a perfect recipe! I use a very heaping 1/2 teaspoon of garlic powder just because I love garlic.